Shipping Included in the price of the product when shipped to the contiguous 48 states. Product: Basketball Accessories 227S Huffy / Spalding 227 Basketball Hoop Pro-Image Rim NCAA Orange with White Net Basketball Equipment. This same rim is available in Red (instead of Orange) - 207 Red Pro Image Rim. 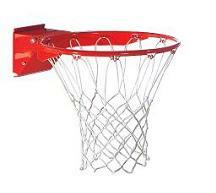 Spalding NCAA Orange Pro Image Flex Basketball Hoop is Great as a Huffy Basketball Replacement Rim. 5/8" (1.6 cm) Heavy Duty Solid Steel Pro-Image Flex Rim. Huffy Basketball Pro-Image Rim Has Heavy Duty Wrap Around Support. Model 227 Huffy Basketball Hoop Pro Image Rim has a Totally Enclosed Spring Return Mechanism	. Hydra Rib Basketball Model 227 Pro Image Rim has High Gloss Powder Coated Finish. Huffy Basketball Rims Have Multi-Bolt Hole Patterns measuring 3" top to bottom and 4" across. Huffy Sport Hoop Replacement Rims include a white all-weather net. All Hardware Enclosed with Pro Image Rims from Huffy Sports / Spalding. 227s Huffy Sport rim serves as replacement Hydra Rib Model 227 Pro Image Rim. Spalding Pro Image 227 Arena Style Basketball Rims look like rims in the NBA. Packaging Dimensions: 20.10" x 6.00" x 25.20". 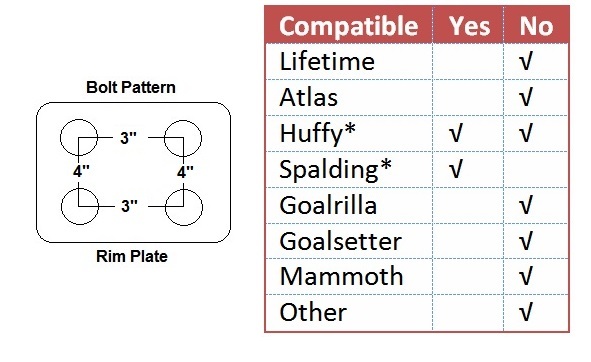 *Is compatible with most Spalding/Huffy models including 88461G, 88454G, and 74560 (the beast). Please check your bolt pattern before ordering. 227 Huffy Basketball Rims And Nets weigh about 12 lbs. The Spalding Pro Image Rim is great as a replacement for your old Huffy Rim. Also see our Lifetime model 5820 basketball rim and our other Huffy Replacement Parts. Competitive Edge Products, Inc. is an authorized reseller of Spalding Basketball Accessories. If you find the 227s Pro-Image Flex rim for cheaper anywhere else online, please let us know. We will try to match or beat their advertised price (price of the product + any shipping costs). GREAT SELLER, FAST SHIPPING. THANK YOU! 5 Star Business ... Great Communication, Fast To Ship, Great Prices, Buy From Here! Haven't used it yet because it is a Christmas present for our Granddaughter. My husband, a basketball player himself bought this hoop because of its quality. He was not disappointed when we received it in the mail. He is looking forward to installing it and shooting some hoops with our Granddaughter. We manufacture basketball goals and only use these Spalding Rims with nets. They are regulation size and preferred by our customers. While the product itself is fine, Competive Edge shipped me a used basketball rim. The box was torn and taped together. The rim is self was scratched and the contents of the box was missing two bolts. I had to go to a hardware store to buy two additional bolts.Seller Response: We do not sell used items. We been selling this rim for over 10 years now. We don't even have access to used items. However, if something is damaged in shipping sometimes the freight carrier will repackage and re-tape the item. That is likely what happened here and we are happy to completely replace the entire rim free of charge. Q: I have a Spalding basketball #600077 that fell. I need the hoop replaced. Would this work? A: That's a good question. There are hundreds of different basketball systems and not all rims are interchangeable. You will want to call 800-558-5234 to determine whether this is compatible with your existing Spalding system. Q: I ordered the rim today. Requested and paid for Fed Ex shipping. Noticed that it states shipping will begin on June 5th. Is this correct or is that date only reflective of the free shipping? A: Please contact our customer service department and they will assist you with this at websales@competitiveedgeproducts.com. Feel free to contact us with any other questions. Q: Does this work on any Spalding model or just the beast? A: This only works on the beast. Fast Shipping: Orders for the 227S Replacement Basketball Rim for the Beast generally leave the warehouse the next business day. Dimensions: 24" x 19" x 4"